Good things seem to come in 3’s in my universe. The epitome being the boys. I’ve also learned through my better half that 3 is also the perfect number of ingredients needed in his recipe for a happy summer day with the kids. Daddy Day Care was in full force this morning. With a day of leisure, actually a weekend of leisure ahead of us, we agreed to divide and conquer to take care of our grown up “duties.” Daddy was on the a.m. shift as I headed to the office to tie up loose ends before our escape. Summer crept up on us, as it often does, and I actually forgot that this was actually the first official summer weekend where the entire gang (grandparents, siblings, aunts, uncles, cousins) was heading up north to the family cottage. As I had considered our recent condo adventure to be our “great escape,” it seemed strange to be planning an escape from an escape. And I just realized – relative to the number 3… we will now be living in 3 places. Can you spell c-o-n-f-u-s-i-o-n? The morning was off to an easy start, despite the hurried agenda, and there were still interesting construction sights for all of us to see right outside of our window. We can’t believe that in all of this time, we’ve never actually seen the pouring of cement. This was an exciting first! So, here we go. Daddy’s simple 3 step plan for an amazing summer morning with 3 young boys. Actually, a good three step plan to add “happy” to anyone’s day. Step 1. Food. 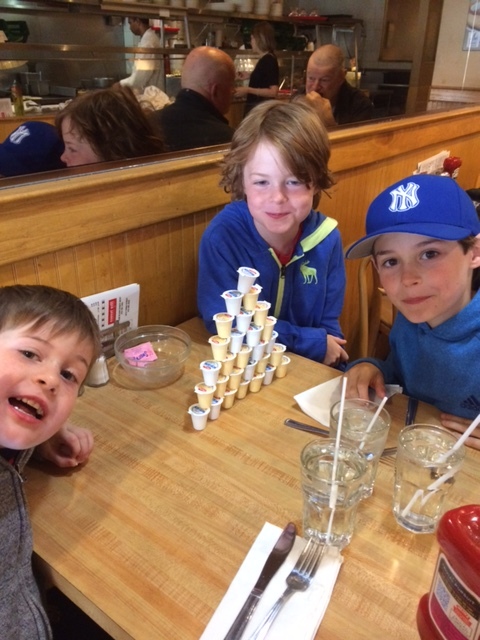 A convenient neighbourhood breakfast (outside of our own condo kitchen this time) was the opening act on Daddy’s playbill for the boys this morning. And breakfast just happens to be their favourite meal, and one that I indulge them in. Every morning there’s actually a fleeting domestic dispute on why I insist on spending the most intense amount of effort and time on a meal that occurs during what is unanimously agreed upon as the busiest hour of the day, not just for our family, but for the majority of families out there. The answer is primarily, because they eat it, and partially because I made it (and this tiny but decadent meal makes me feel like I’m not failing motherhood in some small way). French Toast, chocolate chip flapjacks, mommy-made steel cut oatmeal with brown sugar of course… you name it, I make it. Breakfast is my salvation. I’m not much of a domestic goddess, but early a.m. cuisine seems to be my calling, if I in fact have one. Other than my carrot cake of course, which is a family declared favourite. This morning’s dispute didn’t happen obviously, as my kitchen was left untouched and sparkling. And by the way, after my hubby’s kvetch about the electric stove, I’d like to add something. Great meals do NOT always require a gourmet chef-style environment. I’ve been doing a bit of research. Turns out that it’s the chef that’s the most critical component of creating amazing meals. 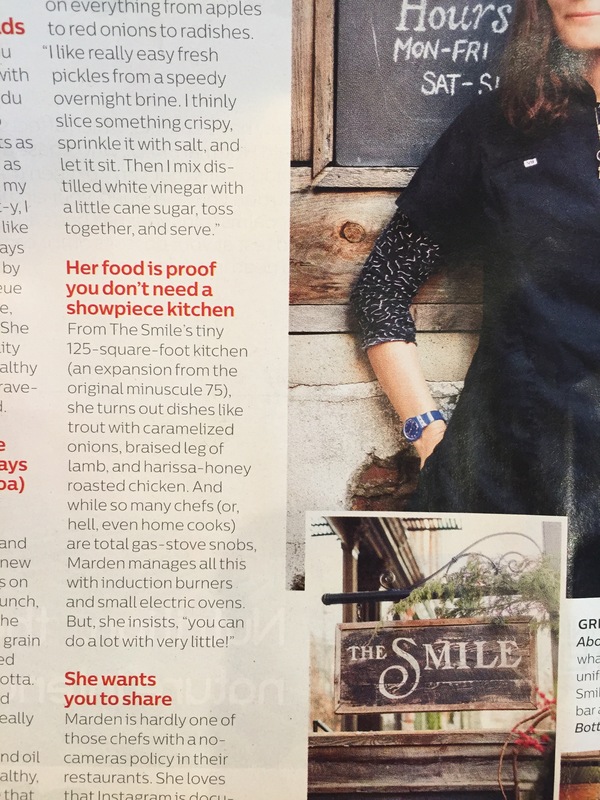 Check out this incredibly tiny but tasty restaurant in NYC, The Smile, featured in Shape magazine, that has 125 sq.ft. kitchen. Can’t wait to try it next time I go. Dinner time has changed for most of us, indeed. This photo diary takes you on a journey of one photographer’s search to document the dinners of a culturally rich city, such as our own. Step 2. Exercise. Thank God someone proved the fallacy of waiting 30 minutes after you eat to swim, because a dip in the plunge pool was next on the agenda and patience was not the boy’s strong suit, (both big and small boys). So in they splashed, dove and soaked . I’m starting to easily understand the confusion my seven year old has between a hotel and our condo. My husband’s concern was that it was TOO hot in the pool area. Not the water itself, but the surrounding air. 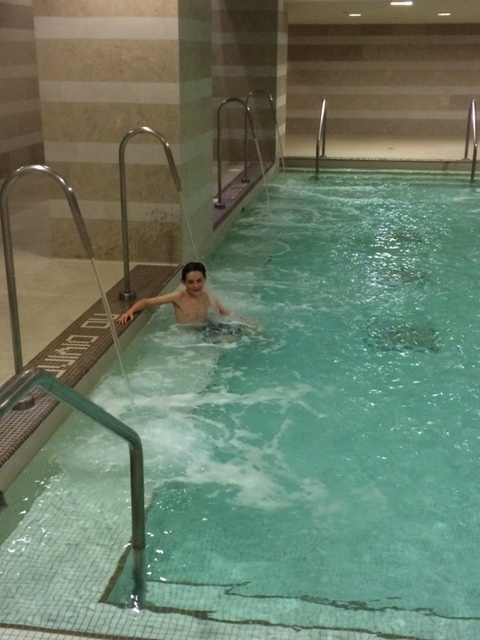 I assured him that this is how indoor pools often work, but I’ll check with Management. Step 3. Entertainment. Full tummies and some physical activity were great predecessors for some downtime. Off they walked to the movie theater. And by the time the film was over, I had returned home and it was my turn to take over. Never quite as entertaining as Daddy, my “job” for everyone was to pack their bags for our weekend get away. Rather than a chore however, they were delighted and packed up with delight, anticipating all that the next 48 hours would have in store. It’s still eye-opening to me that when packing from our smaller-scaled-down “condo closets,” there is still a surplus of wants-not-needs for each of us, that stare us blindly in the face. We turned off our “all-off” light swithch, locked up and headed down the corridor to the elevator. Dog, boys, suitcase – all in one easy trip down to P2. And off we went. Or so we thought. One final trip back up the elevator… someone forgot their iPad. Previous Post Day 27 – Living in 3 places.